Rating: 3.0/5.0 — Going in circles? If Amorphis fanboyism was an infectious disease, the AMG offices would surely be quarantined due to the terminal cases both AMG and myself suffer from. I’ve always regarded their Tales From the Thousand Lakes as the greatest melo-death album of all time, and few bands can boast a run of releases as consistently brilliant as Eclipse through Skyforger. The Beginning of Times had some great songs, but was overlong, a bit bloated and dragged badly on the back-end. I’m sure I wasn’t alone in expecting a big bounce back from the Finnish titans, and it was with typically high expectations that I welcomed the Circle promo when it finally arrived. 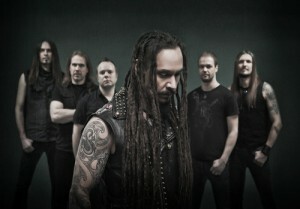 Amorphis certainly took a step back from the oversized approach on Beginning, and Circle is a short, concise, nine song outing with fairly direct writing. There are a few great moments, a slightly more gothy vibe and it’s an enjoyable spin, but again it seems something is amiss in the realm of Sampo. There’s too much filler (though of a higher caliber than last time) and the material lacks that high level punch and addictive quality heard on albums like Silent Waters and Skyforger. While it’s still worth hearing and will appeal to most fans to a greater or lesser extent, it isn’t anywhere near as good as the early output of the Tomi Joutsen era and that sends Steel Druhm into a sad spiral. 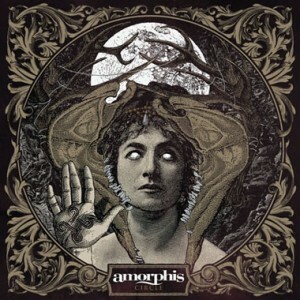 The highlight of Circle comes at the beginning with “Shades of Grey.” This is classic Amorphis through and through and would have fit right in on Silent Water. Tomi flashes his impressive death roar where appropriate and sings the chorus with emotional conviction. The riffing is lively and the writing is crisp and very accessible. They maintain a high level through songs like “Mission” and “The Wanderer,” which has a very big To Die For influence in the writing and especially the chorus (this influence surfaces later in “New Day” as well). “Narrow Path” takes a more folky and festive route which reminds of some of the Skyforger material and so far everything is fine and dandy. Unfortunately, the album bogs down at the mid-point, with neither “Hopeless Days” or “Nightbird’s Song” really impressing, though the latter is convincingly heavy and incorporates black metal influences nicely. Things improve with “Into the Abyss,” which is another textbook example of why Amorphis is so damn good. Everything about the song pops, the chorus is an instant win and Tomi provides a powerful performance. Sadly, things end on a less than stellar note with “Enchanted by the Moon,” which is a bit lackluster and “New Day,” which is rather forgettable and flat. While only “New Day” can be called a poor song, four out of nine tracks fall short of vintage Amorphis, despite interesting moments within each. The more troubling issue is the album’s lack of overall staying power. With platters like Silent Waters and Skyforger, I simply could not spin them enough and they dominated my playlists month after month. Even Beginning held me in its sway for a good while, though I usually only listened to the first three-fourths of the album. Though Circle is mostly enjoyable, at no time did I feel that compulsive need to play it over and over. After a week of moderate playing, I was pretty much done and didn’t return to it until I had to review it. I hesitate to say the writing feels stale at times, but it does. I hesitate even more to compare this to the works of inferior bands like Amaranthe, but in the same way you might burn out on their poppy, bubble gum metal choruses after a week of play, so did I lose interest in much of Circle, though this is obviously much better (so hold off on the hate mail and death threats, you internet warlords). Performance-wise, everyone sounds tight and together. Tomi continues to evolve and improve as a vocalist and he nails both the death vox and the melodic cleans. His delivery is quite poignant and emotional when called for and even his forays into blackened croaks during “Nightbird ‘s Song” are convincing and savage. The riffs from Esa Holopainen and Tomi Koivusaari are generally infectious, lively and immediate and though there’s a nod to a more gothic style at times, their riffing style is largely unchanged. The shortcomings are all a matter of writing and maybe this should have been a more crisp seven song affair (I know, I know, then you would be pissed you only got seven measly songs). Amorphis is a band I hold in the highest regard, so it galls me to see them releasing back-to-back platters that fall short of past brilliance. They maintain a unique style and sound and Circle has some solid moments, but the “Meh” factor cannot be dismissed this time. I’m fervently hoping they re-circle the wagons and give us something better next time, but I suppose this will do for now.